Protect your business from counterfeit banknotes by using the most modern technology. The authenticity of a banknote is reliably tested in less than one minute. The Soldi 460 offers the highest protection against counterfeit banknotes by checking the combination of various security features. A staff training is no longer necessary! All Euro banknotes can be inserted in any desired direction. The device can be adjusted in order for it to detect the tested banknotes from the front or the rear. The device warns acoustically and visually when a suspect note has been detected. This clear result offers more security to your employees in their daily cash operations. In addition to this, the device counts the number and the value of the banknotes checked. The Soldi 460 can be purchased with update function to keep currency detection up to date and a rechargeable battery for the mobile use. The fear of receiving counterfeit money at the point of sale always leads to unpleasant moments during the daily cash transactions. 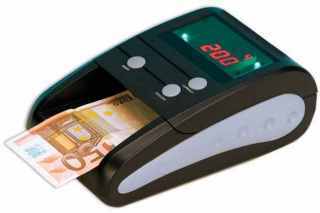 The Soldi Smart is extremely reliable due to the 100% detection of counterfeit banknotes. 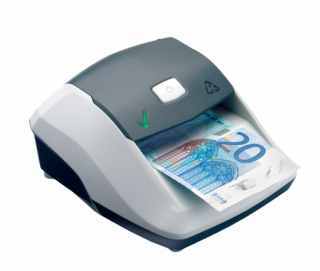 The device is easy to use and tests, fast and reliable, Euro banknotes directly at the point of sale. The automatic counterfeit detection provides a precise result. A staff training for the recognition of the security features is no longer necessary. The result of the test is indicated acoustically, through a warning signal, as well as visually, through a symbol. The device can be placed almost anywhere due to its compact format. The Soldi Smart is ideal for the mobile use thanks to the rechargeable battery (additionally available). The easy-to-open cover facilitates the removal of either jammed banknotes or dirt.